CHARLOTTE, N.C. (AP) — North Carolina’s largest metro area was discovering just how hard it is to conduct business without county computers that handle numerous transactions on Thursday, a day after local leaders refused to pay hackers who froze their system. Mecklenburg County computer systems that collect property taxes, handle building permits and process jail inmates were out of commission while technology workers made digital repairs with backed-up data. Officials say the fixes will take days. County officials were also taking new precautions against fraudulent emails because hackers have launched a new attack in response to their refusal to pay ransom. No further damage to the system was reported. In the meantime, a variety of transactions with county government were being done on paper. Mecklenburg County manager Dena Diorio told staff in an email Thursday that the county was disabling employees’ ability to open attachments generated through Dropbox and Google Docs because of renewed attacks. Many county-run services have been delayed. The sheriff has said it’s taking longer to manually process arrestees, as well as inmates due to be released. Counties in Indiana and Alabama are among those that have paid to regain access to data frozen by cyberattacks since late last year. The Montgomery Advertiser reported that Montgomery County, Alabama, faced disruptions to some operations even after paying hackers in September. Other public organizations have chosen to rebuild instead of paying hackers. In November 2016, a ransomware attack on San Francisco’s transit system resulted in officials shutting down ticketing machines, allowing free rides for much of a weekend. But transit officials didn’t pay a ransom. The St. Louis library system said it took days to restore electronic services for patrons and weeks more to fix all of its computers after it refused to pay hackers behind a ransomware attack this year. 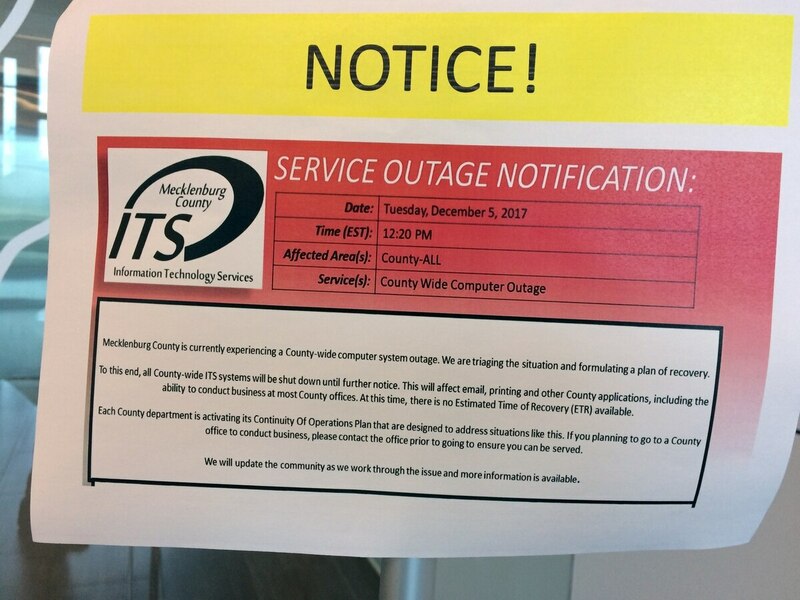 Mecklenburg County revealed Tuesday that it was facing a computer outage after an employee opened an email attachment containing malicious software. Hackers had sought digital currency worth more than $23,000 to unlock the data. A forensic examination shows 48 of the county’s 500 servers were affected, Diorio said, adding that county government officials believe the hacker wasn’t able to gain access to individuals’ health, credit card or social security information. Without getting the compromised servers unlocked, the county will have to rebuild significant parts of the system using the backup data.